using its ServoPro press technology. 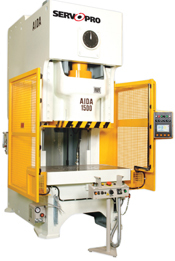 The firm offers servo-driven stamping presses from 80 to 3000 tons, in a variety of model types. An in-booth demonstration of its NC1-1500(D) 150-ton gap-frame servo press will showcase the completely programmable stroke, speed, and motion profiles possible with ServoPro.